Two-way time transfer involves signals that travel both ways between the two clocks or oscillators that are being compared, as shown in the figure below. A half-duplex channel is a one-way system that is turned around to retransmit a signal in the opposite direction. In this method, the one-way delay between the transmitter and receiver is estimated as one-half of the measured round trip delay. The delay estimate can be sent to the user and applied as a correction, or the transmitter can advance the signal so that it arrives at the user's site on time. The latter is how the NIST Automated Computer Time Service (ACTS) system works. Internet time transfers using the Network Time Protocol (NTP) also use a half-duplex technique. A full-duplex system uses one-way signals transmitted simultaneously in both directions. In this case data must be exchanged in both directions so that the two data sets can be differenced. Both two-way methods have advantages and limitations. The half-duplex system has the advantage of only requiring "reflecting" hardware at one station, but it is susceptible to fluctuations in the delay, especially when the period of the fluctuations is comparable to the round trip delay. A full-duplex system does not have this problem since timing information is transmitted in both directions simultaneously. However, it requires complete transmit and receive hardware at both stations. A full duplex two-way system does not depend on the actual length of the path, provided that the inbound and outbound delays are equal. This requirement may be difficult to realize completely since these systems usually require separate station hardware for the two directions (with delays that may not be the same). The transmission medium can also cause asymmetries if it is dispersive and if the signals in the two directions use different frequencies. A full duplex two-way technique using a geostationary communications satellite as a relay station is illustrated below. This technique is called Two-Way Satellite Time and Frequency Transfer (TWSTFT). The TWSTFT technique provides stable and accurate time transfer since nearly all of the propagation delay cancels out due to symmetry. Recently the Bureau International des Poids et Mesures (BIPM) has started using two-way via a commercial Ku-band communication satellite as the primary time transfer technique for some European and transatlantic links, since it performs significantly better than GPS common-view. A significant disadvantage of TWSTFT is the added complexity of having to have both transmit and receive hardware at each station. It is also more expensive, since it requires paying for satellite time if a commercial communications satellite is used. In the TWSTFT technique the basic time interval measurements are made with Time Interval Counters (TICs) at each site. The TICs are started by a pulse from the local clock and stopped by the received pulse from the remote clock. At the same time as the local clock pulse is starting the TIC it is also being transmitted to the other station. The same process goes on at both stations. Typically a one pulse per second (PPS) signal is used. This time interval data is recorded at both sites and then the data files are exchanged and differenced. Generally there is sufficient bandwidth in the communications link that the data can be transferred at the same time that the timing pulses are being transmitted. Thus the two-way technique can be used in essentially real time. The time interval information that is recorded at each station contains the clock differences as well as various delays as shown in the equations below. where TIC(A) and TIC(B) are the time interval counter readings, A and B are the respective clock times, the dXXs are the respective propagation delays illustrated in the figure, and SA and SB are Sagnac corrections. Note that SB = -SA and SA is positive if B is east of A. The value of SA is 2 Ar/c2 for stations on the earth's surface, where is the angular velocity of the earth, c is the speed of light, and Ar is the area defined by the projections onto the equatorial plane by the line segments connecting the satellite and the earth's center to the two earth stations. The TIC values are always positive for reasonably well synchronized clocks since the time up to and back from the satellite is on the order of a quarter of a second. The time difference between clocks A and B can be determined from equations 1 and 2 by differencing the individual simultaneous TIC readings with the result shown below. As can be seen most of the path delays tend to cancel. However, there is no reason for the transmit and receive delays of the earth station equipment to cancel perfectly since they are caused by physically different pieces of equipment. This area is one of the major sources of instability and inaccuracy in the two-way technique. The satellite delays, dSAB and dSBA, may perfectly cancel since in some cases the same satellite transponder is used for both directions. In other cases different transponders are used and then the cancellation is not perfect. The up and down link paths are physically the same, but the propagation delay is not exactly the same if the up and down link frequencies are different. This is generally the case. For Ku-band the up link is normally at 14 GHz and the down-link is at 11 GHz. Therefore the effect of the ionosphere is not the same. However, the tropospheric delay will cancel to a large extent since it does not depend strongly on frequency. Another advantage of this two-way technique is that the signal to noise ratio is favorable. 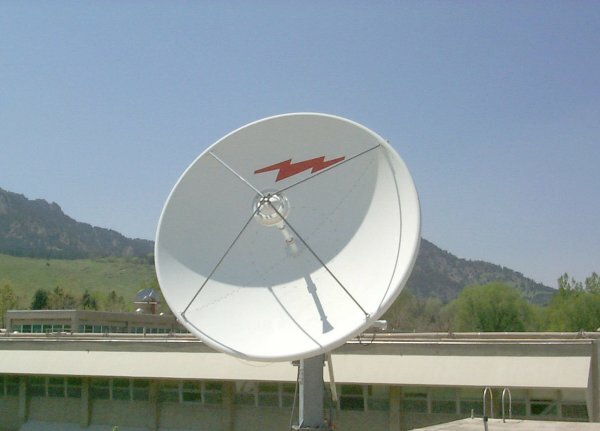 Antenna reflectors of one or more meters diameter are normally used at the ground stations, as shown in the photograph. These highly directional antennas also reduce multipath. The stability of TWSTFT over a 24 hour period is better than 1 ns and has been observed to be as low as 100 picoseconds in some systems. TWSTFT systems can be calibrated to the 1 ns level, but this requires a portable earth station. D. W. Hanson, Fundamentals of Two-Way Time Transfer by Satellite, 43rd Annual Frequency Control Symposium, pp. 174-178, 1989. For questions or more information contact Victor Zhang at victor.zhang@nist.gov.